This weekend I'm doing something new: going to a knitting retreat! I've been to festivals, I've taken classes, I've done demonstrations, I've gone to plenty of knitting groups, but I've never gone somewhere away from home for the express purpose of just hanging out and knitting with strangers. What'll it be like? Who knows? I'll report back! The one that I'm going to is organized by Paula of the podcast The Knitting Pipeline, which is one of my very favorite knitting-related podcasts. 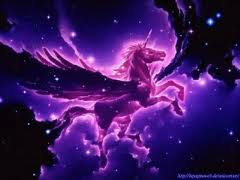 She's always throwing some interesting non-knitting content in there-- nature and Celtic music, among other things. It's very well produced and presented, and she seems like she's going to be a fun person to know. Plus she used to correspond by letter with Elizabeth Zimmerman, so if there's a six-degrees-of-Kevin-Bacon-but-for-knitting I'll clearly be doing pretty well. 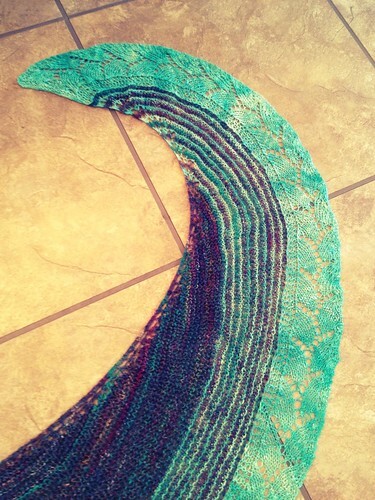 She's also the designer of one of my recent finished objects, the Piper's Journey shawl. This is made of handspun, and I love it. I totally picked out an outfit to bring to the retreat so I can debut the shawl there. You bet I'm that dorky. I know I've written about this before, but I love podcasts. I listen to many of them, both knitting related ones and all sorts of other things. I like to listen to the knitting ones during times I can't knit-- usually when I'm using a form of transit where it would be quease-inducing or unsafe to knit. Also sometimes while I'm eating. When I'm actually knitting, I tend to listen to other ones. When I spin, I love listening to audiobooks. I've found a great group of knitters here in my new hometown that are a hoot to knit (and bowl, and watch movies, etc) with, but knitting podcasts are the next best thing, especially if you ever have introverted days where you're happy to listen and not contribute to the conversation. I do have lots of introverted days, but this weekend I'm wearing my extrovert hat (or shawl, as it were). Hope y'all have a fun weekend! I admit it, one of the cons of moving back to Chicago was that it's hard to imagine the midwest doing sheep and wool festivals as well as new england does them. So it is with great cheer that I report that YarnCon ("Chicago's indie fiber fair") was awesome, despite its lack of sheep, alpacas, barns, and deep-fried pickles. 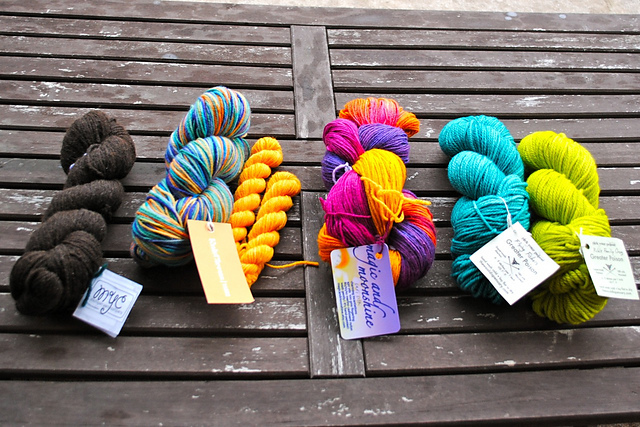 From left to right, we have some manly yarn from the Michigan Yarn Company; a future baby sweater from Knit Circus; a future toddler sweater from Magic and Moonshine, and a not-so-far-in-the-future hat from the Wool Dispensary. I was really impressed by the quality of yarns being sold by all the dyers there. Ending up with "only" five new skeins took some serious willpower. More than a week later, I still can't stop thinking about the Wool Dispensary. Everything they had was *awesome*. They had a limited selection of colors, and I'm not exaggerating when I say I loved every single one of them. It was really hard for me to choose two colors, and I don't want to say I'm doubting my choice, because I love these together; so instead, we'll say I'm already plotting future orders. I've already balled the acid green and teal and am happily knitting away; the yarn seems sturdy and I hope it wears well, because that would justify me buying a sweater's worth, right? So here's the tough thing about spinning some large portion of a fleece-- in my case it's half of this Merino fleece Jenny Jo and I split at Maryland Sheep and Wool last year. It is a whole lot of the same color. And although it's a lovely natural color, it sure does have me wishing Emma the sheep had been born teal or fuchsia. I divided it all up by weight into what I thought would be one third of a bobbinsworth (boy was I wrong) and put them in this fun container. But my best hope for actually getting all the fleece spun was to power through. I spun to the exclusion of all my other spinning devices, rocking out to audiobooks and podcasts, and just getting it done. Here's when I was starting to see the light at the end of the tunnel. And here's what I ended up with. It's a traditional 3 ply except for the tiny skein which is chain-plied from leftovers. Now here's the interesting part. I noticed, as soon as I pulled the yarn of the niddy-noddy, that it shrank up to much less than the two yard hank the tool is designed to measure. So after the yarn was all spun and plied, I washed them, doing an alternating soapy hot/clear cold/vigorous agitation treatment to full the yarn a little, since it honestly doesn't seem like the most stable yarn I've ever spun. 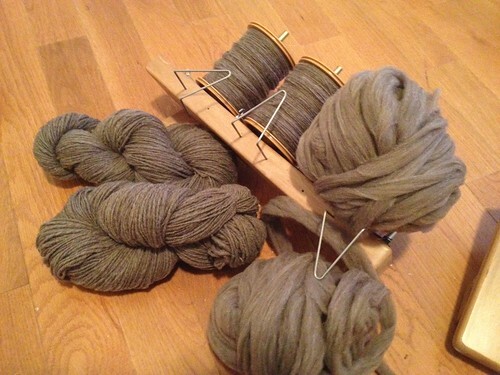 Once it had dried I remeasured the distance around the skein, counted the strands, and calculated a true yardage. 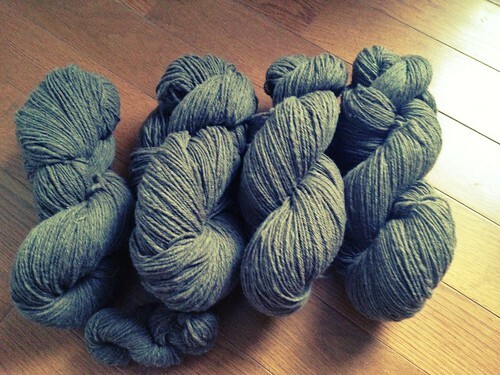 I got about 1,228 yds of a DK-ish weight yarn. Pretty good! 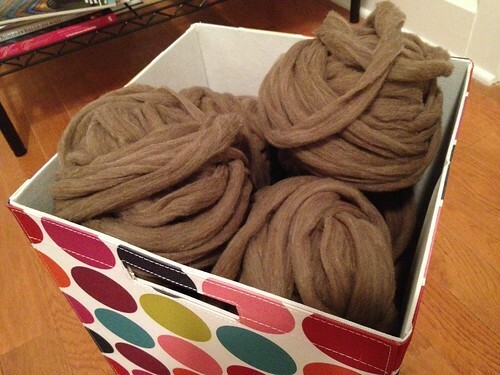 Had the yarn not sprung back so dramatically? It would have been 1,842 yards. WHOA. I lost over 600 yards to SPROIOIOIOINNNNG! I have a few projects I am trying to finish up first, but getting started on this yarn is my next priority. I'm aiming for an honest to goodness Rhinebeck sweater this year, and given how long it takes me to finish sweaters, 6 months lead time sounds about right.